In this article explained about defections of point in geometry math, Collinear Points, Non-collinear points with examples. In the above figures, the first figure is Point. It has no dimension. If it further add one dimension length then it will be line segment (Line). If further add one more dimension breadth then it will have two dimension which is rectangle(Surface) . Now add one more dimension height then it has three dimension which is cuboid (Solid). Collinear points : Three or more points lying on the same line are called collinear points. Non-collinear points : Three or more points are not lying on the same line are called non-collinear points. 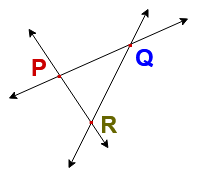 If a point R lies on the line “ l “ then points P , Q & R lie on the same line and are said to be collinear points. 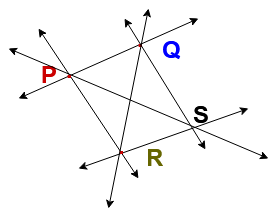 If a point R does not lie on the line “ l “ , then points P, Q and R do not lie on the same line and are said to be non- collinear points. Thanks for reading. 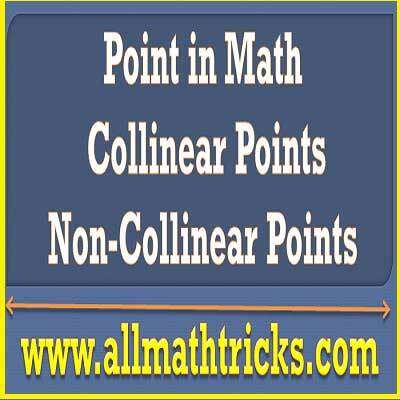 I Hope you liked this article “Point in Math | Collinear Points | Non-collinear points”. Give feed back, comments and please don’t forget to share it.